Every once in a while from time to time a newspaper headline will just jump off the page. Not for its athletic prowess or shyness but for its shear absurdity. You have to wonder if the journalist or editor responsible for said headline had their head in a crack pipe that morning. Did they know what they were doing or were they purposely that farcical. Whatever the case these creations for headline banners are priceless if only for their entertainment value and comic relief. You don’t have to look much past the internet to find funny headlines. This entry was posted in News, Slider and tagged Funny Headlines, Humor, postaday2012 on March 1, 2012 by Mickey Mills. Is it any wonder there’s a “Them vs. Us” mentality these days? Them being big banks and high-finance types at the top of the American money pyramid. Meet Florida’s Tom Mudie. This guy is like many in our country these days. The economy tanked and Mudie had to renegotiate his mortgage. Millions of homes have been under foreclosure the past couple of years. Families are living in their cars wondering what happened to the American dream. Tom caught a break. He recently got word that his loan modification had been approved and his mortgage payment would reduce by $200. That may not sound like much but when you are struggling to buy groceries a couple of c-notes makes all the difference in the world. So he did just that thinking the problem was solved. “Holy, living in the streets, Batman! !” For 80 pennies Bank of America is ready to put this guy in the streets. If there is any company in America that doesn’t need any bad press its Bank of America with their CEO, Ebenezer Scrooge. They are still reeling from the $5.00 debit card fee and the South Carolina branch manager ripping up American Flags set along the street by her bank to honor a fallen soldier. That bonehead move had people lined up the next day to withdraw their money from the big bad BOA. It appears that Bank of America is very much like the Tin Man. No Heart. But all is not lost. Someone showed up with common sense and took the horses off the foreclosure wagon. Tom Mudie may not lose his house after all. At least not today and not over 80 cents. This entry was posted in News, Slider and tagged Bank of America, Foreclosure, postaday2012, Tom Mudie on January 13, 2012 by Mickey Mills. I’ve taken everything mother nature has to give out— Hurricanes, tornadoes, extreme heat, Lady Gaga and The Cable Guy. And now I can add earthquake to the list. It was nearly 11:00 last night when I felt the first little bump and the whole house started shaking back and forth. The ceiling fan began to sway, the dogs sorta freaked out, and my heart went into overdrive. According to the US Geological Survey a 5.6 earthquake struck central Oklahoma at 10:53 p.m. There were not reports of injury or major damage. The 5.6 sets a new state record. A magnitude 5.5 struck El Reno on April 9, 1952. An aftershock of 4.0 rolled through at 3:39 but we slept through that one. Although that might explain my earthquake dreams all night. We have a new crack in one of the walls and I have a new respect for mother nature. I still haven’t forgiven her for The Cable Guy. 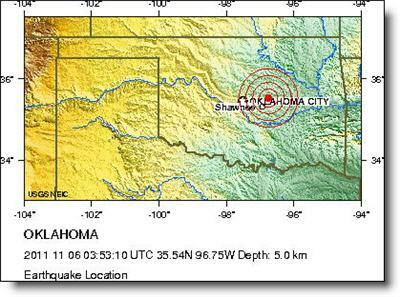 This entry was posted in News and tagged Earthquake, Oklahoma, Oklahoma earthquake, postaday2011 on November 6, 2011 by Mickey Mills. That used to mean something rather benign. It meant you stomped through mud or played with frogs. It meant you got into a tussle with your best friend right before (or after) you laughed together at a pack of little girls. At worst ‘boys being boys’ meant cutting school to go to a movie or stealing candy from a store shelf. In the news, two 12 year old boys dropped a shopping cart four stories unto a shopper below. She remains in critical condition. A 10 year old pulled a pistol on a woman threatening to take his Halloween candy. A 12 year old sits in a Florida jail, the youngest person ever charged in that state with capital murder. He killed his two year-old brother. In Indiana an 11 year-old shot and killed his 6 year-old brother. These stories just go on and one. It makes me wonder where we are going. What will it be like in 20 years if it keeps getting worse. What is the solution? Better parenting? Stable environment? Is it found in the schools or the home? 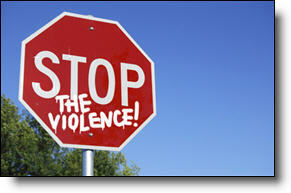 The problem is so complex I’m not sure anyone really knows where to begin to stop the flow of violence by our children. I’m going to offer an opinion here, something I typically hesitate to do. I think our children are getting programmed to violence by the things they see around them, on TV, in the news, in movies and video games. When you are a 6-grader sense of right and wrong is a very fragile thing. That has to start at home. The schools can’t be responsible for instilling values in our children. That must be done by the parents. It has to start somewhere. Marion Salmon Hedges, the victim of the shopping cart incident lies in a hospital bed clinging to life. Her family and the boy’s families have their lives upended by a stupid prank. A community is shocked and bewildered at how something like this could happen. Police report that the boys were laughing and telling jokes as they were being taken into custody. The arresting officer repeated that the boys were just “Doing it for fun.” I suspect the fun ended when the steel doors slammed shut and the prospect of years locked away started to creep in. My fear is this issue is a symptom of a much bigger problem, a society so immune to stories like this that people can’t even see the problem much less admit there is one. The status-quo is not good enough and if you are not part of the solution you are part of the problem. Food for thought—this is not someone else’s problem. We all own it. This entry was posted in News, Opinion and tagged Marion Salmon Hedges, postaday2011, Youth Violence on November 3, 2011 by Mickey Mills. Hurricane Irene Was a Bit of a Biotch! Hurrican Irene pounded the east coast over the weekend and continues to flood New England in epic fashion. She lashed the South Carolina coast last Friday as she made her way offshore to a Saturday morning landfall along the Outer Banks. At that time Irene had all the makings of a major catastrophe. As bad as the flooding in the northeast and the projected eight billion in damages we should be counting our blessings for what didn’t happen rather than moaning over what did. Yes, the relatively few lives lost was tragic, but given a slightly different path or a slightly different travel speed that sent Irene right up the Hudson River and we could be looking at an entirely different aftermath; hundreds or possibly thousands of lives lost. My prayers go out to my east coast neighbors struggling to deal with the property damage and personal loss. As always the American Red Cross steps forward as the preeminent global disaster relief organization to reach into the affected communities and provide a helping hand in the face of tragedy. This entry was posted in News, Weather and tagged Hurricane Irene, postaday2011, Red Cross on August 29, 2011 by Mickey Mills. An exhibition basketball game between the Georgetown Hoyas and a Chinese men’s team ended abruptly when an all out brawl consumed the facility. I went to a fight and a basketball game broke out. Both benches cleared and it was upper-cuts, jabs and folding chairs for the ensuing melee. The fight broke out at the 9.5 minute mark remaining in the 2nd quarter. The rest of Georgetown’s game against the Bayi Rockets was canceled. The Hoyas are scheduled to play the Rockets again on Sunday night in Shanghai. Ringside seats are still available. This entry was posted in News, Sports and tagged basketball fight, Georgetown Hoya's, NCAA Basketball, postaday2011 on August 19, 2011 by Mickey Mills.